Brian Kirkwood (born 20th September 1952) was a very unusual athlete, who produced nearly all his finest performances after becoming a veteran at the age of 40. He seemed to be a very private, dedicated individual: it was obvious that he trained intelligently, and lived healthily, so that a tremendous amount of racing could be done every year. As part of the elite Racing Club teams, especially in the 1990s, Brian had a huge amount of success. Particularly in Scotland, his performances as a Veteran are almost unmatched. Rumour has it that Kirkwood used to be a racing cyclist. The first mention of ‘B. Kirkwood, runner’ may be in the 1980 National Senior Cross Country Championships, when someone of that name finished 82nd, representing Lochaber AC! By 1982 the genuine Brian Kirkwood was running considerably better for Edinburgh Athletic Club and improving to 33rd. Then he was a meritorious 16th in 1983 but only 34th in 1984. 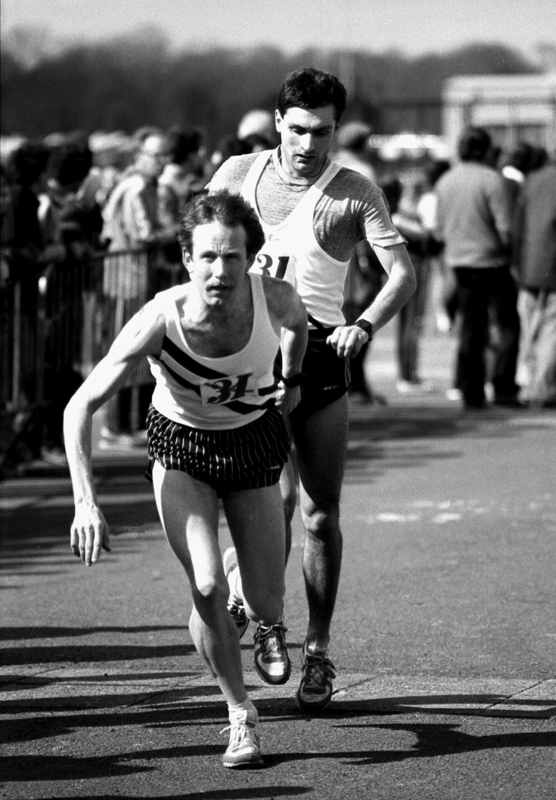 EAC also took part in the Edinburgh to Glasgow Road Relay and Brian ran, rather slowly, in 1981. However his improvement was dramatic since, only a year later, his team won silver medals, with Kirkwood second fastest on Stage Seven. He also featured in 1984 and 1986, but further progress came in 1987, when his team were second once more, with Brian fastest on Stage Three. In 1988 EAC were fourth, with BK second fastest on Three, gaining seven places! The Scottish Six-Stage Relay in Strathclyde Park was another venue where Kirkwood and EAC had a measure of success: bronze in 1982, silver in 1983 and his first Scottish team gold medal in 1984. His club changed its name to ESPC AC in the 1990 E to G, finishing fourth, with Brian third-fastest on Stage Three. Then in 1991 ‘Racing Club Edinburgh’ was formed – an all-star collection featuring many of Scotland’s best runners. Naturally the new organisation won team gold in 1991, with Kirkwood having a good run on the important Stage Two. 1992 produced another clear victory with Brian fastest on Stage One. And the First Leg became Kirkwood’s territory for several years. New sponsorship meant that the club’s name changed again. ‘Leslie Deans RC’ won the Edinburgh to Glasgow in 1993, 1994 and 1995, with Brian on Stage One each time. ‘Mizuno RC’ were victorious in 1996 (BK on One); but then, although the elite club won again in 1997, Brian ran Stage Five. The Six Stage Relay produced further Scottish medals for Brian Kirkwood’s speedy club: gold medals in 1991, 1992 and 1993 but ‘only’ silver in 1994. Gold in 1995; silver in 1996; and a final gold in 1998. The road seemed to be Kirkwood’s favourite surface. He had a fine record in the famous Tom Scott Memorial 10 Mile Road Race: third place (aged 39) in 1992, then 3rd again and first M40 in 1993, being timed at an outstanding personal best 47.51. Brian was second in 1994 (individual Scottish Senior Championship silver medal in 48.39, only 24 seconds down on the redoubtable Tommy Murray; and, of course, Scottish Masters gold); third (1st M40) in 1995; second (1st Vet) in 1996; and First M40/45 in 1998 and 2000. In 1995 Brian Kirkwood won a Senior Scottish title at the age of 42, with a victory in the Dumfries Half Marathon, clocking 67.38. In 1994 he had won Scottish Masters 10k gold in Aberdeen. 1995 was especially notable for the ‘Sun Life Great Race’, between 2nd and 23rd of September, from Glasgow to Edinburgh. After the event, “Scotland’s Runner” magazine reported as follows. The winner of the inaugural Sun Life Great Race was Paulo Catarino of Portugal who collected prize money of £35,000 for his not inconsiderable efforts. Twenty six year old Catarino completed the 230 mile, 20 stage race in the incredible time of 18-32-43. Consistency was the key to the event, illustrated by the fact that Catarino did not win a single stage over the three weeks of the race. The deciding factor in his triumph was that he did not finish any lower than eighth on any given day. Delmir dos Santos, the 24 year old Brazilian running for the American Boulder Road Runners Club took the green vest for the overall points winner. His colossal total of ten stage victories ensured his success. The first four stages of the race were dominated by 43 year old Kenyan, Kipsubei Kisgei if not always for the right reasons! Although he won all three Scottish legs, he self destructed when he was seen to strike dos Santos on the fourth stage from Gretna to Carlisle. The starting field numbered 107 when the race got under way in Glasgow on September 2nd. By the day of the final Westminster stage, only 82 runners remained. Many of the ‘big’ names withdrew or failed to finish including Mike McLeod, John Graham, Fraser Clyne (who was supposed to write a diary of the event for ‘Scotland’s Runner’), Steve Brace, Gary Kiernan and Dave Moorcroft. In the team contest, the lead changed hands many times before the Boulder outfit took the title. It is obvious that, against a field of top class runners, Brian Kirkwood showed great stamina and intelligence by pacing himself admirably and proving that he was indeed a worthy member of the ‘UK Elite’. In the Senior National Cross Country, Brian featured in Racing Club teams that secured team silver medals in 1992; 1993 (when Brian was a fine 14th and of course first Master); and 1995 bronze (24th and first M40 again). His record in the Scottish Masters Cross Country Championship is superb. Between 1993 and 1996, Kirkwood won M40 gold four years in succession; before fifth place (behind Fraser Clyne) in 1997. Then he returned to the winner’s rostrum to secure M45 gold in 1998 (third overall, with Ed Stewart the M40 victor); 1999 (second overall to M40 Keith Varney); and 2000. Finally, Brian won M50 titles in 2004 (running for Phoenix Racers) and 2005 (for Lasswade AAC). Brian Kirkwood’s Power of 10 profile is well worth reading. He won endless 10k races all over Scotland and the North of England; and quite a few half marathons too. Particular First Veteran successes were in the 1994 Great Scottish Run Half Marathon; the Brampton to Carlisle; and the Barnsley 10k. He also competed successfully several times in the USA, for example in the Peachtree 10k and Brooklyn Half Marathon. Other Scottish Masters wins came in many championships: 5000m; 10,000m; indoor 3000m (he also won the British Veterans M45 3000m in 2000); 10k; 10 miles; and Half Marathon. Brian competed for Scottish Veteran Harriers versus Northern Vets but, strangely, did not represent Scottish Masters in the annual British and Irish Home Cross Country International, let alone in European or World Veteran events. In 2008, Brian finally started to race less often. For a while he ran only the Portobello Promathon plus one or two other events. He seems to have stopped competing after 2013.